ON ALL ORDERS THAT ARE PAID FOR AT THE SAME TIME. THIS IS A FANTASTIC PIECE OF INTERIOR PAGE ARTWORK. WE HAVE PICTURED ALL SIDES SO YOU CAN SEE ALL THE PRODUCTION NOTES AND DETAILS. 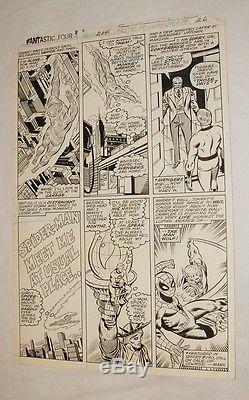 The item "FANTASTIC FOUR ISSUE #204 PAGE 14 STEVE POLLARD ORIGINAL COMIC ART w SPIDER MAN" is in sale since Thursday, January 12, 2017. This item is in the category "Collectibles\Comics\Original Comic Art\Interior Pages"." and is located in West Palm Beach, Florida. This item can be shipped to United States.